When you are getting started with stamp collecting, it is usually best to take a broad approach rather than focusing on a specific category of stamps. 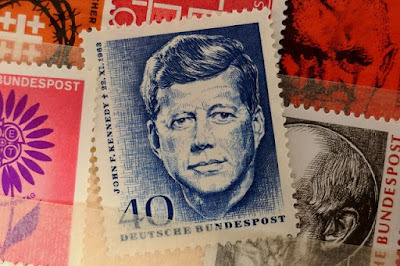 By gathering a wide variety of stamps from different categories, you can build a solid collection while educating yourself along the way. When you buy new stamps, make sure to put them into albums right away. Once you get enough stamps, you can begin sorting them into different albums based on categories or topics. There are also software programs that you can use to help keep track of your collection. Collecting foreign stamps can be a lot of fun if you are the type of person who enjoys traveling or learning about other countries. Oftentimes, countries will print portraits of some of their most famous residents on the stamps, giving you a glimpse into their history. As your stamp collecting experience grows, you may want to narrow your focus. For instance, you may want to collect stamps that focus on one of your hobbies or interests. If you love classic cars, you could look for stamps that feature cars. Alternatively, if you are into sports, you could collect sports-related stamps instead. The possibilities are practically unlimited. The best part about stamp collecting is that it is an affordable hobby to get started with. You can find some really amazing stamps available for relatively low prices according to USA Stamp Guide. You can also socialize with other people who enjoy stamps by joining a club or organization in your area. Oftentimes, these groups hold get-togethers where you can meet other people and talk about your stamp collection. They also provide you with a chance to trade stamps with other people or to purchase rare stamps for your collection. During these events, you may even be able to gather tips on how to properly care for your collection. If you want, you can even form your own club by getting your friends involved in stamp collecting. As each of you grows your collection, you can compare your latest finds. Of course, you can always collect stamps on your own, as well. You can purchase stamps online - often at extremely good prices. Best of all, it is easy to search for whatever types of stamps you want. Stamp collecting can be a fun and relaxing hobby since it allows you to focus your attention on finding beautiful stamps that appeal to you. When you find a stamp that you have been looking for, there is a feeling of genuine excitement. Stamp collecting is something that never goes out of style. You can continue to build your collection over your lifetime, learning more about stamps along the way. Because there are so many different types of postage stamps out there, you never have to worry about getting bored or running out of options.